This is the fourth post in our series of getting started with 3D printing using the Replicator Mini. Last time we figured out how to print a hollow version of Cute Octopus Says Hello by setting Infill to 0%. This made an octopus model that was enclosed with a hollow center. We'd prefer to print an octopus shell with no base, but there are no settings in the Advanced Options that allow us to remove that base. With goal in mind, today we'll see what happens if we try to mess with the MakerWare/Desktop slicing profile. If you enjoy having things go wrong and failing, then you're going to love doing this. Sometimes a miracle happens and you find just the right combination of settings to do wonderful things, but most of the time it is a journey of sadness and defeat. Let's go! From the Settings menu, press the "Create Profile..." button. A new window will pop up. Step 2: Choose a Template. Step 3: Give your Profile a name. Make it a descriptive name, if you are planning on making a lot of these. I also recommend taking notes on what you change from the template from each profile. Or, if you don't mind crazy names then you can encode those notes into your Profile name, as I did below. Here is a situation where something that caused me and my entire lab a week of confusion and delay can be your good fortune. Or at least a warning to not repeat our mistake. DO NOT EDIT TWO PROFILES AT THE SAME TIME. "cheap" - Filament is money, and for many prints the raft uses as much filament as the model itself. Changing the line below will decrease the number of millimeters that the raft extends past the base of the model from 4mm to 2mm, thereby minimizing the size of the raft. It's a little harder to get the model off the raft with such a small outside border, but it's okay for simple prints. So really after all that we just changed five lines of code. If you're interested in reading more about what each line in the slicing Profile does, check out the MakerWare/Desktop slicing Profile settings webpage. Step 5. Save and close your Profile. Now save the text document you have been modifying, and close it. Do not forget to close it or you may run into the type of problem I mentioned in Step 4. Step 6. Select your Profile and Print! Whenever you want to use your custom Profile, you can now select it from the drop-down menu. 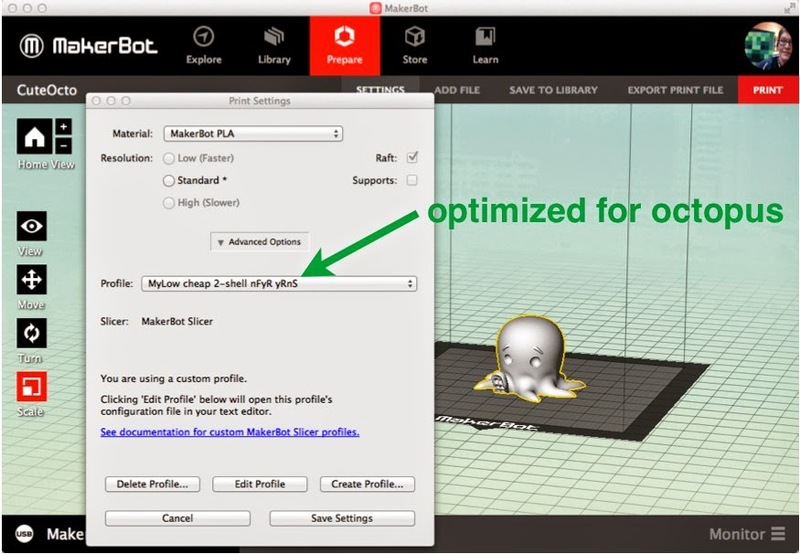 Select your profile, click "Save Settings", and print your object to see what happens. The second thing that our custom Profile got us is time and money. 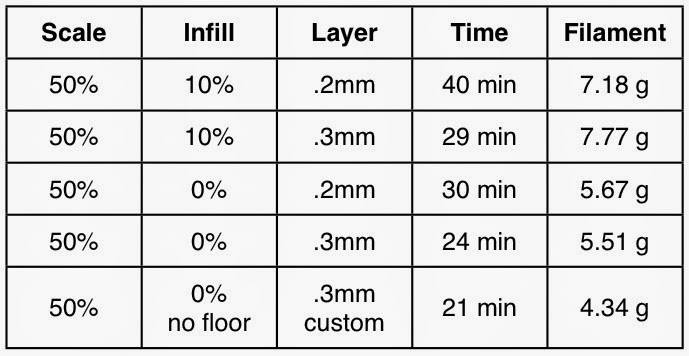 Here's the table of time and filament costs from yesterday, with a new row for today's print added at the bottom. 1 cute octopus = 4.34 grams x ($18 / 227grams) = 34 cents. 1 cute octopus = 4.34 grams x ($48 / 907grams) = 23 cents. That's just over half of the cost of our first octopus print! It may seem silly to worry about a difference of twenty-five cents, but if you have to print in bulk for a classroom or event, or if you want to print something larger than a little octopus, then the time and money savings won't seem so silly anymore. Next time: Making the octopus cuter and giving him a purpose.